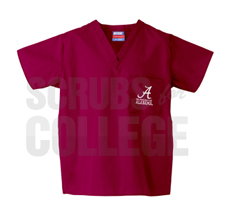 This GEL medical scrub top lets you show your collegiate school support every day while still maintaining a professional look. Available in sizes XS-3XL. 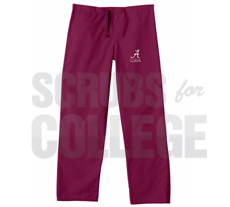 These University of Alabama medical scrub pant from Burcs provide an amazing look at a fantastic price. Show support for your collegiate school with these IguanaMed school logo unisex scrub pants. 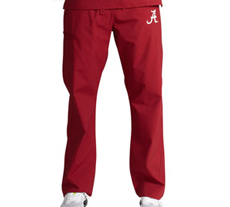 Made from MF comfort stretch material, these pants are perfect for any alumni or fan! Available in sizes XS-3XL. Show support for your collegiate school with this IguanaMed school logo unisex scrub top. 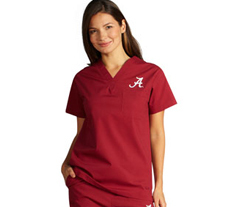 Made from MF comfort stretch material, this top is perfect for any alumni or fan! Available in sizes XS-3XL. These GEL medical scrub pants let you show your collegiate school support every day while still maintaining a professional look. Available in sizes XS-3XL.